Having the FUN Homeschool doesn’t have to be hard, take a lot of time, or empty your pockets. It doesn’t even have to be messy. And fun is an easy way to connect with your kids! When you allow your FUN homeschool to happen, you create a relaxed atmosphere of learning, living, and growth. And what’s so awesome is that you and your kids get to decide how to design your FUN homeschool, based on your interests, goals, and personalities. Because fun is a relative concept, unique to each family and homeschool. Your homeschool fun may look like no one else’s and that’s perfectly perfect. Homeschool fun may be a part of your routine, built into your day with activities like brain breaks. Or homeschool fun can be used as motivation, a reward at the end of your homeschool day for jobs well done. Fun can be anticipated in the form of special events, with countdown chains and morning announcements. For example, celebrating a fun holiday like Dictionary Day or plotting out a field trip. It can happen when you least expect it, with smiles that erupt into chuckles over a silly character in a read-aloud. And fun can become a memory, some precious moment to think back on and savor. Your homeschool may thrive with easy, open-and-go type of fun. Printables and kits work well when you’re short on time or patience. Or perhaps you seek out a bit of creative challenge and prefer DIY homeschool fun projects that take days, even weeks, to complete. Fun doesn’t have to be perfect or expensive. It can be adding scribbles and stickers to that empty paper towel roll and turning it into a pirate spyglass that adds zest to mapwork during geography. 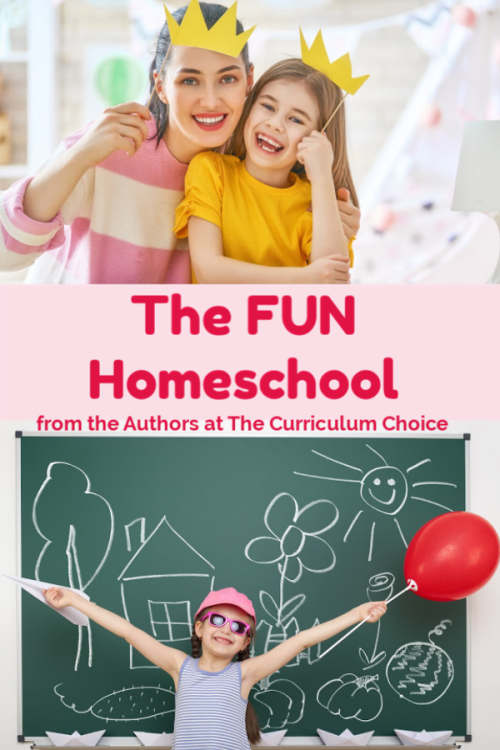 The FUN Homeschool is the one you create with your kids within your comfort level. And it’s the homeschool that helps you share smiles as you build special memories together. 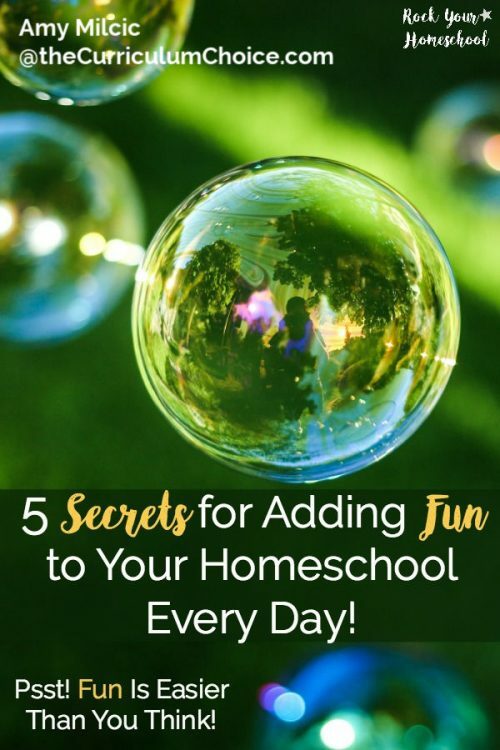 5 Secrets for Adding Fun to Your Homeschool Every Day! Learning does involve intense and deliberate effort, but it can also include pure delight. After over twenty years of homeschooling, we have discovered a lot of ways to make learning fun. Once a year we have Reading Week, during which we cancel schoolwork and just spend our usual learning time reading. We used to read aloud every day, and now that our teens are busy with jobs and volunteering, that is what I miss the most. Do check out our family’s Top Twenty Read Alouds and make the most of the time you still have before your children become too busy. Often a child or teen will be fascinated by one certain topic, from computer programming to icing cakes, from writing stories to working with horses, from history to health. If at all possible, we allow ours to delve deeper into such topics; here is a link about turning a passion into a high school credit, and here is another one detailing some of the Pitfalls of Delight Directed Learning. Gardening is one of those activities that has negative as well as positive aspects. Yet it has often been fun, and our five children have all learned so much from The Homeschool Garden. Physical education is an excellent way to build fun into our homeschool. In the past we used to hike and we even walked sections of the amazing Rideau Trail. Our most exciting phys ed activity has been floating down the river in the late spring, drifting past rocks and under overhanging wildflowers in our life jackets. Of course, cooking is one of the most enjoyable things of all. It is an exciting challenge and a grown up thing to do, it involves lots of learning, it can be done over and over, and the results are usually delicious. 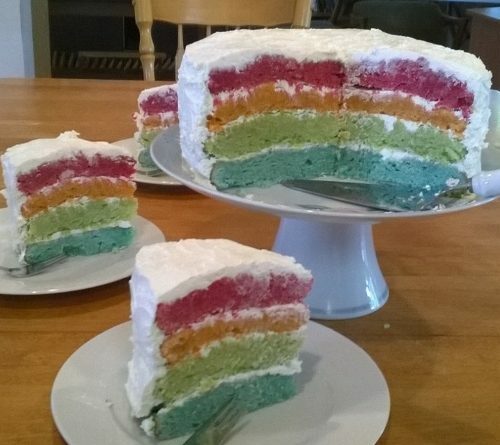 Food that looks pretty, like these Banana Peach Mushrooms, or that was a satisfying challenge to make, like this lemon meringue pie adventure, or that combined both, like the colorful layer cake pictured above, made by an eleven-year-old after intense effort, all involve many layers of fun and learning. And, if you ask us on good days, homeschooling itself is fun. I agree! Homeschooling itself is fun. Yes, we all have those days that are not rosy and perfect. But for the most part, learning together is joy. Here are a few ways we mix in the homeschool fun! How to Fit in All The Homeschool Extras – just a few tips for making sure you get to the good stuff. And here are 5 Fun Ways to Learn with Tapestry of Grace. 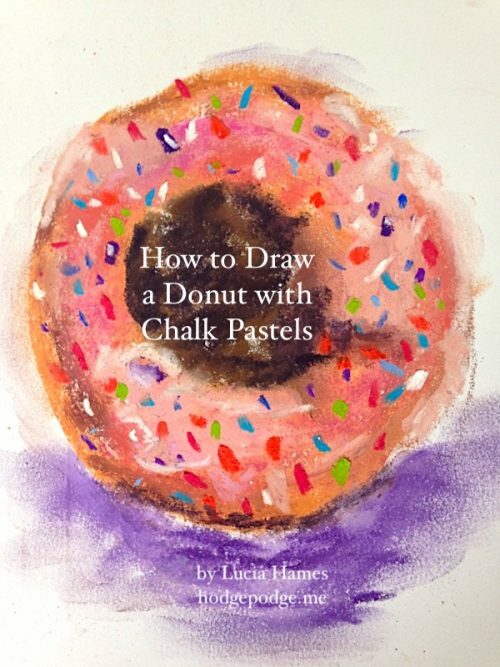 That lovely cake by Annie Kate’s daughter reminds me of Nana’s How to Draw a Donut in Chalk Pastels and Chocolate Chip Cookies as well. Plus we have 15 Fun and Free Art Lessons. Of course, so much of our fun revolves around art time. Especially at Christmas, artists love this most popular art lesson ever at Hodgepodge – Glowing Christmas Tree. Come summer we like to continue to build good habits and often turn to our Chalkboard of Summer Prompts. Come to think of it, that would be a fun thing to do any time of the year! Like the I’m Bored Christmas Edition. What are YOUR favorite homeschool fun ideas? We would love to know!